This article is about the Latter Day Saint leader. For the fictional character, see The Abduction Club. James Jesse Strang (March 21, 1813 – July 9, 1856) was an American religious leader, politician and self-proclaimed monarch. In 1844 he founded the Church of Jesus Christ of Latter Day Saints (Strangite),[lower-alpha 1] a faction of the Latter Day Saint movement that he claimed to be the sole legitimate continuation of the Church of Christ founded by Joseph Smith fourteen years before. A major contender for leadership of the Church of Jesus Christ of Latter Day Saints during the 1844 succession crisis, Strang vied with Brigham Young and Sidney Rigdon for control of the organization in Nauvoo, Illinois before his rejection there subsequently led him to start his own sect. While serving as Prophet, Seer and Revelator of his church, Strang reigned for six years as the crowned "king" of an ecclesiastical monarchy that he established on Beaver Island in the US state of Michigan. Building an organization that eventually rivaled Young's in Utah, Strang gained nearly 12,000 adherents prior to his murder in 1856, which brought down his kingdom and all but extinguished his sect. In contrast to Joseph Smith, who used the eminently republican title of "President of the Church," Strang taught that the chief prophetic office embodied an overtly royal attribute, by which its occupant was to be not only the spiritual leader of his people, but their temporal king as well. He offered a sophisticated set of teachings that differed in many significant aspects from any other version of Mormonism, including that preached by Smith. To bolster his claims, Strang published translations of two purportedly long-lost works: the Voree Record, deciphered from three metal plates reportedly unearthed in response to a vision; and the Book of the Law of the Lord, supposedly transcribed from the Plates of Laban mentioned in the Book of Mormon. These are accepted as scripture by his followers, but not by any other Latter Day Saint church. Although his long-term doctrinal influence on the Latter Day Saint movement was minimal, several early members of Strang's organization helped to establish the Reorganized Church of Jesus Christ of Latter Day Saints, which became (and remains) the second-largest Mormon sect. While most of Strang's followers eventually disavowed him, a small but devout remnant continues to carry on his teachings and organization today. In addition to his ecclesiastical calling, Strang served one full term and part of a second as a member of the Michigan House of Representatives, and assisted in the organization of Manitou County. He was also at various times an attorney, educator, temperance lecturer, newspaper editor, Baptist minister, correspondent for the New York Tribune, and amateur scientist. His survey of Beaver Island's natural history was published by the Smithsonian Institution, remaining the definitive work on that subject for nearly a century, while his career in the Michigan legislature was praised even by his enemies. However, his polygamous lifestyle and sometimes abrasive personality made him many enemies inside his church and out of it, contributing to his ultimate demise. James Jesse Strang was born March 21, 1813, in Scipio, Cayuga County, New York. He was the second of three children, and his parents had a good reputation in their community. James' mother was very tender with him as a consequence of delicate health, yet she required him to render an account of all his actions and words while absent from her. In a brief autobiography he wrote in 1855, Strang reported that he had attended grade school until age twelve, but that "the terms were usually short, the teachers inexperienced and ill qualified to teach, and my health such as to preclude attentive study or steady attendance." He estimated that his time in a classroom during those years totaled six months. But none of this meant that Strang was illiterate or simple. Although his teachers "not unfrequently turned me off with little or no attention, as though I was too stupid to learn and too dull to feel neglect," Strang recalled that he spent "long weary days ... upon the floor, thinking, thinking, thinking ... my mind wandered over fields that old men shrink from, seeking rest and finding none till darkness gathered thick around and I burst into tears." He studied works by Thomas Paine and the Comte de Volney, whose book Les Ruines exerted a significant influence on the future prophet. As a youth, Strang kept a rather profound personal diary, written partly in a secret code that was not deciphered until over one hundred years after it was authored (by Strang's own grandson Mark Strang, a banker in Long Beach, California). This journal contains Strang's musings on a variety of topics, including his desire to "rival Caesar or Napoleon" and his regret that by age nineteen, he had not yet become a general or member of the state legislature, which he saw as being essential by that point in his life to his quest for fame. However, Strang's diary equally reveals a heartfelt desire to be of service to his fellow man, together with agonized frustration at not knowing how he might do so as a penniless, unknown youth from upstate New York. At age twelve, Strang was baptized a Baptist. He did not wish to follow his father's calling as a farmer, so he took up the study of law. Strang was admitted to the bar in New York at age 23 and later at other places where he resided. He became county Postmaster and edited a local newspaper, the Randolph Herald. Later, in the midst of his myriad duties on Beaver Island, he would find time to found and publish the Daily Northern Islander, the first newspaper in northern Michigan. 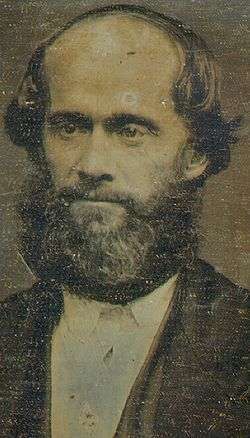 Strang, who once described himself as a "cool philosopher" and a freethinker, became a Baptist minister but left in February 1844 to join the Church of Jesus Christ of Latter Day Saints. He quickly found favor with Joseph Smith, though they had known each other only a short time, and was baptized personally by him on February 25, 1844. On March 3 of that year he was ordained an Elder by Joseph's brother Hyrum and sent forthwith at Smith's request to Wisconsin, to establish a Mormon stake at Voree. Shortly after Strang's departure, Joseph Smith was murdered by an anti-Mormon mob in Carthage, Illinois. 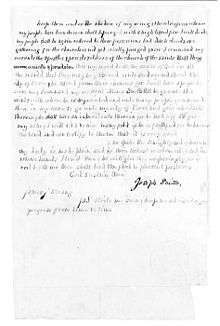 Page three of Strang's "Letter of Appointment," with allegedly forged signature of Joseph Smith. Following Smith's demise, several men claimed the right to lead the Latter Day Saints. The most significant of these were Brigham Young, president of Smith's Twelve Apostles; Sidney Rigdon, the sole surviving member of Smith's First Presidency; and James Strang. A power struggle ensued, and Young eventually led the bulk of Smith's followers to Utah while Rigdon led a smaller group to Pennsylvania. As a newcomer to the faith Strang did not possess the name recognition enjoyed by his rivals, so his prospects of assuming Smith's prophetic mantle appeared shaky at first. But this did not dissuade him. Though the Quorum of Twelve quickly published a notice in the Times and Seasons of Strang's excommunication, Strang insisted that he had never received a legitimate trial. He equally asserted that the Twelve had no right to sit in judgment on him, as he was the lawful President of the church. To bolster his claim Strang produced a "Letter of Appointment" allegedly from Smith, carrying a Nauvoo postmark and dated June 18, 1844, just nine days before Smith's murder. He furthermore testified that an angel ordained him as Joseph Smith's successor at the time Smith died. Smith and Strang were some 225 miles (362 km) apart at the time, and Strang offered witnesses to affirm that he had made his announcement before news of Smith's demise was publicly available. Strang's letter is held today by Yale University. Although the postmark is legitimate, some modern analysts have asserted that Joseph Smith's signature on the third page is a forgery. One former Strangite claimed that Strang's law partner conspired with Strang to fabricate his Letter of Appointment and the Voree Plates, though no proof of this was ever produced. Strang's letter convinced several eminent Mormons of his claims, including Book of Mormon witnesses John and David Whitmer, Martin Harris and Hiram Page. [lower-alpha 3] In addition Apostles John E. Page, William E. M'Lellin, and William Smith,[lower-alpha 4] together with Nauvoo Stake President William Marks, and Bishop George Miller,[lower-alpha 5] accepted Strang at first. A newspaper affiliated with Strang, the Voree Herald, claimed that Joseph Smith's mother, Lucy Mack Smith, and three of his sisters accepted Strang's claims, although this is disputed. The newspaper alleges that Lucy Smith wrote to one Reuben Hedlock: "I am satisfied that Joseph appointed J.J. Strang. It is verily so." According to Joseph Smith's brother William, all of his family (except for Hyrum and Samuel Smith's widows), initially endorsed Strang. Also championing Strang was John C. Bennett, a physician and libertine who had enjoyed a less than stellar career as Joseph Smith's Assistant President and mayor of Nauvoo. Invited by Strang to join him in Voree, Bennett was instrumental in establishing a so-called "Halcyon Order of the Illuminati" there, with Strang as its "Imperial Primate." Eventually Bennett's profligate ways caught up with him, as in Nauvoo, and Strang expelled him in 1847. His "order" fell by the wayside and has no role in Strangism today, though it did lead to conflict between Strang and some of his associates. About 12,000 Latter Day Saints ultimately accepted Strang's claims. However, not all of these followed him to Beaver Island in Lake Michigan, where church headquarters was moved in 1848. Most of his initial adherents, including all of those listed above (with the exception of George Miller, who remained loyal to Strang until death), would leave Strang's church before his demise. John E. Page departed in July 1849, accusing Strang of dictatorial tendencies and concurring with Bennett's furtive "Illuminati" order. Martin Harris had broken with Strang by January 1847, after a failed mission to England. Hiram Page and the Whitmers also left around this time. Many defections, however, were due to Strang's seemingly abrupt "about-face" on the turbulent subject of polygamy. Vehemently opposed to the practice at first, Strang reversed course in 1849 to become one of its strongest advocates, marrying five wives (including his original spouse, Mary) and fathering fourteen children. Since many of his early disciples viewed him as a monogamous counterweight to Brigham Young's polygamous version of Mormonism, Strang's decision to embrace plural marriage proved costly to him and his organization. Strang defended his new tenet by claiming that, far from enslaving or demeaning women, polygamy would liberate and "elevate" them by allowing them to choose the best possible mate based upon any factors deemed important to them—even if that mate were already married to someone else. Rather than being forced to wed "corrupt and degraded sires" due to the scarcity of more suitable men, a woman could marry the man she saw as the most compatible to herself, the best candidate to father her children and give her the finest possible life, no matter how many other wives he might have. Strang's first wife was Mary Perce, whom he married on November 20, 1836, when she was eighteen and he was twenty-three. They were separated in May 1851, though they remained legally married until Strang's death. His second wife, married on July 13, 1849, was nineteen-year-old Elvira Eliza Field (who disguised herself at first as "Charlie J. Douglas," Strang's purported nephew, before revealing her true identity in 1850). Strang's third wife was thirty-one-year-old Betsy McNutt, whom he married on January 19, 1852; his fourth was nineteen-year-old Sarah Adelia Wright, married on July 15, 1855. Ironically, decades after Strang's death, Sarah would divorce her second husband, one Dr. Wing, due to his interest in polygamy. Strang's last wife was eighteen-year-old Phoebe Wright, cousin to Sarah, whom he wed on October 27, 1855, less than one year before his murder. Sarah Wright described Strang as "a very mild-spoken, kind man to his family, although his word was law." She wrote that while each wife had her own bedroom, they shared meals and devotional time together with Strang and that life in their household was "as pleasant as possible." On the other hand, Strang and Phoebe Wright's daughter, Eugenia, wrote in 1936 that after only eight months of marriage, her mother had "begun to feel dissatisfied with polygamy, though she loved him [Strang] devotedly all her life." Like Joseph Smith, James Strang reported numerous visions, unearthed and translated allegedly ancient metal plates using what he said was the Biblical Urim and Thummim, and claimed to have restored long-lost spiritual knowledge to humankind. Like Smith, he presented witnesses to authenticate the records he claimed to have received. Unlike Smith, however, Strang offered his plates to the public for examination. The non-Mormon Christopher Sholes—inventor of the typewriter and editor of a local newspaper—perused Strang's "Voree Plates", a minuscule brass chronicle Strang said he had been led to by a vision in 1845. Sholes offered no opinion on Strang's find, but described the would-be prophet as "honest and earnest" and opined that his followers ranked "among the most honest and intelligent men in the neighborhood." Strang published his translation of these plates as the "Voree Record," purporting to be the last testament of one "Rajah Manchou of Vorito," who had lived in the area centuries earlier and wished to leave a brief statement for posterity. While many scoffed, Strangites assert that two modern scholars have affirmed that the text on the plates appears to represent a genuine, albeit unknown, language. This assertion has not been verified by independent sources, however. The Voree Plates disappeared around 1900, and their current whereabouts are unknown. Strang also claimed to have translated the "Plates of Laban" described in the Book of Mormon. This translation was published in 1851 as the Book of the Law of the Lord, said to be the original Law given to Moses and mentioned in II Chronicles 34:14–15. Greatly expanded and republished in 1856, this book served as the constitution for Strang's spiritual kingdom on Beaver Island, and is still accepted as scripture by Strangites. One distinctive feature (besides its overtly monarchial tone) is its restoration of a "missing" commandment to the Decalogue: "Thou shalt love thy neighbor as thyself." Strang insisted that versions of the Decalogue found in Bibles used by other churches—including other Latter Day Saint churches—contain only nine commandments, not ten. Strang received several other revelations, which while never formally added to his church's Doctrine and Covenants, are nevertheless accepted as scripture by his followers. These concerned, among other things, Baptism for the Dead, the building of a temple in Voree, the standing of Sidney Rigdon, and an invitation for Joseph Smith III, eldest son of Joseph Smith, to take a position as Counselor in Strang's First Presidency. "Young Joseph" never accepted this calling and refused to have anything to do with Strang's organization. Strang also authored The Diamond, an attack on the claims of Sidney Rigdon and Brigham Young, and The Prophetic Controversy, ostensibly for Mrs. Martha Coray, co-author with Lucy Mack Smith of The History of Joseph Smith by His Mother. Coray, a partisan of Brigham Young's, had challenged "the vain usurper" to provide convincing evidence of his claims, and Strang attempted to oblige in this open letter addressed to her. Coray's reaction to Strang's missive has not been preserved. Some of Strang's teachings differed substantially from those of other Latter Day Saint leaders, including Joseph Smith. For instance, Strang rejected the traditional Christian doctrines of the Trinity and the Virgin Birth of Jesus Christ, together with the Mormon doctrine of "plurality of gods." A monotheist, he insisted that there was but one eternal God of all the universe, the Father, and that "progression to godhood" (a doctrine allegedly taught by Joseph Smith toward the end of his life) was impossible. God had always been God, said Strang, and He was but one Person and not three, as in the traditional Christian Trinity. Jesus Christ was presented as the natural-born son of Mary and Joseph, who was chosen from before all time to be the Savior of mankind but who had to be born as an ordinary mortal of two human parents (rather than being the offspring of the Father or the Holy Spirit) to fulfill his Messianic role. Strang claimed that the earthly Christ was in essence "adopted" as God's son at birth, and fully revealed as such during the Transfiguration. After proving himself to God by living a perfectly sinless life, he was enabled to provide an acceptable sacrifice for the sins of men, prior to his resurrection and ascension. Furthermore, Strang denied that God could do all things, and insisted that some things were as impossible for Him as for us. Thus, he saw no essential conflict between science and religion, and while he never openly championed evolution, he did state that God was limited in His power by the matter He was working with and by the eons of time required to "organize" and shape it. Strang spoke glowingly of a future generation who would "make religion a science," to be "studied by as exact rules as mathematicks." "The mouth of the Seer will be opened," he prophesied, "and the whole earth enlightened." Musing at length on the nature of sin and evil, Strang wrote that of all things that God could give to man, He could never give him experience. Thus, if "free agency" were to be real, said Strang, humanity must be given the opportunity to fail and to learn from its own mistakes. The ultimate goal for each human being was to willingly conform oneself to the "revealed character" of God in every respect, preferring good to evil not out of a fear of punishment or any desire for reward, but rather solely "on account of the innate loveliness of undefiled goodness; of pure unalloyed holiness." Strang believed strongly in the seventh-day Sabbath, and enjoined it in lieu of Sunday; the Strangite church continues this tradition. He advocated baptism for the dead, and practiced it to a limited extent in Voree and on Beaver Island. He also introduced animal sacrifice–not for sin, but as a part of Strangite celebration rituals. Animal sacrifices and baptisms for the dead are not currently practiced by the Strangite organization, though belief in each is still required. Strang attempted to construct a temple in Voree, but was prevented from completing it due to the poverty and lack of cooperation of his followers. No "endowment" rituals comparable to those in the Utah LDS and Cutlerite churches appear to have existed among his followers. Eternal marriage formed a part of Strang's teaching, though he did not require it to be performed in a temple (as in the LDS church). Thus, such marriages are still contracted in Strang's church in the absence of any Strangite temple or "endowment" ceremony. Alcohol, tobacco, coffee and tea were prohibited, as in many Latter Day Saint denominations. Polygamy is no longer practiced by Strang's followers, though belief in its correctness is still affirmed. Strang allowed women to hold the Priesthood offices of Priest and Teacher, unique among all Latter Day Saint factions during his lifetime. He welcomed African Americans into his church, and ordained at least two to the eldership. Strang also mandated conservation of land and resources, requiring the building of parks and retention of large forests in his kingdom. He wrote an eloquent refutation of the "Solomon Spalding theory" of the Book of Mormon's authorship, and defended the ministry and teachings of Joseph Smith–as he understood them. Strang claimed that he was to occupy the office of king described in the Book of the Law of the Lord. He insisted that this authority was incumbent upon all holders of the prophetic office from the beginning of time, and his followers believe that Smith himself was crowned secretly as "king" of the Kingdom of God before his murder. Strang was accordingly crowned in 1850 by his counselor and Prime Minister, an actor named George J. Adams. About 300 people witnessed his coronation, for which he wore a bright red flannel robe topped by a white collar with black speckles. His tin crown was described in one account as "a shiny metal ring with a cluster of glass stars in the front." Strang also sported a breastplate and carried a wooden scepter. He "reigned" for six years, and the date of his coronation, July 8, is still mandated as one of the two most important dates in the Strangite church year (the other being April 6, the anniversary of the founding of Joseph Smith's church). A view of Iron Ore Bay on the southern end of Beaver Island. Strang never claimed to be the king of Beaver Island itself, nor of any other geographical entity. Rather, he claimed to be king over his church, which he saw as the true "Kingdom of God" prophesied in Scripture and destined to spread over all the earth. Nor did Strang ever say that his "kingdom" supplanted United States sovereignty over Beaver Island. However, since his sect was the main religious body on the isle, claiming the allegiance of most of its inhabitants, Strang often asserted authority even over non-Strangites on Beaver—which ultimately caused him and his followers a great deal of grief. Furthermore, he and many of his disciples were accused of forcibly appropriating property and revenue on the island, which made him few friends among the non-Mormon "gentiles." On the other hand, Strang and his people lived in apprehension of what their non-member neighbors might do next. Some Strangites were beaten up while going to the post office to collect their mail, and some of their homes were robbed and even seized by "gentiles" while Strangite men were away. On July 4, 1850, a drunken mob of fishermen vowed to kill the "Mormons" or drive them out, only to be awed into submission when Strang fired a cannon (which he had secretly acquired) at them. Competition for business and jobs added to tensions on the island, as did the increasing Strangite monopoly on local government, made sure after Beaver and adjacent islands were attached first to Emmet County in 1853, then later organized into their own insular county of Manitou in 1855. As a result of his coronation, together with lurid tales spread by George Adams (who had been excommunicated by Strang a few months after the ceremony), Strang was accused of treason, counterfeiting, trespass on government land, and theft, among other crimes. He was brought to trial in Detroit, Michigan, after President Millard Fillmore ordered US District Attorney George Bates to investigate the rumors about Strang and his colony. Strang's successful trial defense brought him considerable favorable press, which he leveraged to run for, and win, a seat in the Michigan state legislature as a Democrat in 1853. Facing a determined effort to deny him this seat due to the hostility of his enemies, he was permitted to address the legislature in his defense, after which the Michigan House of Representatives voted twice (first unanimously, then a second time by a 49–11 margin) to allow "King Strang" to join them. In the 1853 legislative session, Strang introduced ten bills, five of which passed. The Detroit Advertiser, on February 10, 1853, wrote of Strang: "Mr. Strang’s course as a member of the present Legislature, has disarmed much of the prejudices which have previously surrounded him. Whatever may be said or thought of the peculiar sect of which he is the local head, I take pleasure in stating that throughout this session he has conducted himself with the degree of decorum and propriety which have been equaled by his industry, sagacity, good temper, apparent regard for the true interests of the people, and the obligations of his official oath." He was reelected in 1855, and did much to organize the upper portion of Michigan's lower peninsula into counties and townships. Strang ardently fought the illegal practice of trading liquor to local Native American tribes. This made him many enemies among those non-Strangite residents of Beaver and nearby Mackinac Island who profited mightily from this illicit trade. James Strang made foes among his own people, too. One of these, Thomas Bedford, had been flogged for adultery on Strang's orders, and felt considerable resentment toward the "king." Another, Dr. H.D. McCulloch, had been excommunicated for drunkenness and other alleged misdeeds, after previously enjoying Strang's favor and several high offices in local government. These conspired against Strang with Alexander Wentworth and Dr. J. Atkyn, who had allegedly endeavored (unsuccessfully) to blackmail the Strangites into paying his numerous bad debts. A decree that female Strangites must wear "bloomers" only added fuel to the fire. Pistols were procured, and the four conspirators began several days of target practice while finalizing the details of their murderous plan. Although Strang apparently knew that Bedford and the others were gunning for him, he seems not to have taken them very seriously. "We laugh with bitter scorn at all these threats," he wrote in the Northern Islander, just days before his murder. Strang's refusal to employ a bodyguard or to carry a firearm or other weapon made him an easy target. The USS Michigan later in its career. On Monday, June 16, 1856, Strang was waylaid around 7:00 PM on the dock at the harbor of St. James, chief city of Beaver Island, by Wentworth and Bedford, who shot him in the back. All of this was carried out in full view of several officers and men of the USS Michigan, a US Naval vessel docked in the harbor. Not one person on board the ship made any effort to warn or to aid the intended victim. Strang was hit three times: one bullet grazed his head, another lodged in his cheek and a third in his spine, paralyzing him from the waist down. One of the assassins then savagely pistol-whipped the victim before running aboard the nearby vessel with his companion, where both claimed sanctuary. Some accused Captain McBlair of the Michigan of complicity in, or at least foreknowledge of, the assassination plot, though no hard evidence of this was ever forthcoming. The so-called "King of Beaver Island" was taken to Voree, where he lived for three weeks, dying on July 9, 1856 at the age of 43. After refusing to deliver Bedford and Wentworth to the local sheriff, McBlair transported them to Mackinac Island, where they were given a mock trial, fined $1.25, released, and then feted by the locals. None of the plotters was ever punished for his crimes. While Strang lingered on his deathbed in Voree, his Michigan enemies determined to extinguish his Beaver Island kingdom. On July 5, 1856, on what Michigan historian Byron M. Cutcheon later called "the most disgraceful day in Michigan history," a drunken mob of "gentiles" from Mackinac and elsewhere descended upon the island and forcibly evicted every Strangite from it. Strang's subjects on the island—numbering approximately 2,600 persons—were herded onto hastily commandeered steamers, most after being robbed of their money and other personal possessions, and unceremoniously dumped onto docks along the shores of Lake Michigan. A few moved back to Voree, while the rest scattered across the country. Strang refused to appoint a successor, telling his apostles to take care of their families as best they could, and await divine instruction. While his supporters endeavored to keep his church alive, Strang's unique dogma requiring his successor to be ordained by angels handicapped his church in its search for a new prophet. Lorenzo Dow Hickey, the last of Strang's apostles, emerged as an ad-hoc leader until his death in 1897, followed by Wingfield W. Watson, a High Priest in Strang's organization (until he died in 1922). Neither of these men ever claimed Strang's office or authority, however. [lower-alpha 6] Left without a prophet to guide them, most of Strang's members (including all of his wives) departed his church in the years after his murder. Most later joined the Reorganized Church of Jesus Christ of Latter Day Saints, which was established in 1860. [lower-alpha 7] A few, however, continue to carry on Strang's mission as best they can, while awaiting a new successor to their fallen founder. Strang's disciples today are divided into two main factions; one is led by a Presiding High Priest, who does not claim to have the authority or priesthood office possessed by Joseph Smith or James Strang. The other claims that the first faction is in error, and that by incorporating in 1961, it lost its identity as a faithful continuation of Strang's organization. This second group claims that it is the sole true remnant of James Strang's church. [lower-alpha 8] Missionary work is no longer emphasized among the Strangites (unlike the LDS and many other Latter Day Saint sects), as they tend to believe that after three murdered prophets (Joseph Smith, Hyrum Smith and James Strang) God closed His dispensation to the "gentiles" of the West. Consequently, Strang's church has continued to dwindle until the present day. Current membership figures vary between 50 and 300 persons, depending upon the source consulted. While proving a key player in the 1844 succession struggle, Strang's long-term influence on the Latter Day Saint movement was minimal. His doctrinal innovations had little impact outside of his church, and he was largely ignored until recent historians began to reexamine his life and career. Even the county (Manitou) he had fought to establish was abolished by the Michigan legislature in 1895, removing the last tangible remnant of Strang's temporal empire. For all his efforts, Strang's most vital (albeit unintended) contribution to the Latter Day Saint religion turned out to be providing some of the impetus behind creation of the Reorganized Church, which became a major rival to the Utah-based LDS Church and other Latter Day Saint groups—including his own. 1 2 The Strangites use no hyphen in their church title and capitalize the "D" in "Day", just as was done in Joseph Smith's church. ↑ Strangites still use these terms today, as do members of some other Latter Day Saint groups. ↑ David Whitmer and Martin Harris, two of the Three Witnesses, and Hiram Page and John Whitmer of the Eight Witnesses. ↑ John Page and William Smith were apostles at Smith's death; William M'Lellin had previously been an apostle, but was excommunicated in 1838. ↑ George Miller, who is mentioned in the LDS Doctrine & Covenants section 124: verses 20, 62 and 70. ↑ No apostles currently remain in Strang's organization, as all Strangite apostles must be appointed by a Strangite prophet. The highest current office in Strang's church is that of High Priest (in the "incorporated" faction) or Elder (in the other). ↑ This organization is now called the Community of Christ. It remains the second-largest church in the Latter Day Saint movement. ↑ The first group has a website: http://www.ldsstrangite.com/; "unincorporated" Strangites have three: http://www.strangite.org and http://mormonbeliefs.com and http://www.strangite.blogspot.com. ↑ "History and Succession". Strangite.org. Retrieved on 2007-10-28. This compares to approximately 50,000 for Brigham Young at this same time. See "Church membership: 1830–2006," at http://www.lds.org/library/display/0,4945,40-1-3474-2,00.html. ↑ Strang 1856, pp. 168–76. 1 2 "Strang, the King". MormonBeliefs.com. Retrieved on 2007-10-28. 1 2 3 4 5 6 7 8 9 10 11 Weeks, Robert P. (June 1970). "For His Was the Kingdom, and the Power, and the Glory ... Briefly". American Heritage 21 (4). ↑ "Church of Jesus Christ of Latter Day Saints". MormonBeliefs.com. Retrieved on 2007-10-28. ↑ Rodgers, Bradley A. (1996). Guardian of the Great Lakes: The U.S. Paddle Frigate Michigan. University of Michigan Press. p. 60. ↑ Post, Warren. "History of James Strang: The Birth and Parentage of the Prophet James". StrangStudies.org. Retrieved on 2007-10-28. ↑ Strang, Mark. (1961). The Diary of James J. Strang: Deciphered, Transcribed, Introduced, and Annotated. East Lansing: Michigan State University Press. Entry for March 21, 1832. ↑ Jensen, Robin (2005). Gleaning the Harvest: Strangite Missionary Work 1846–1850, p. 32. Retrieved on 2016-02-09. 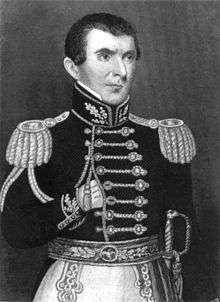 ↑ Greene, John P. (Nauvoo City Marshal in 1844). "150 people who each knew more about Joseph Smith than anyone alive today." Strangite.org, item 48. Retrieved on 2007-10-28. ↑ Times and Seasons, Vol. V., No. 16, September 2, 1844. http://www.centerplace.org/history/ts/v5n16.htm. ↑ Strang 1854b, p. 23. ↑ Quinn, p. 210. See also Eberstadt, Charles, “A Letter That Founded a Kingdom,” Autograph Collectors’ Journal (October, 1950): 3–8. ↑ Jensen, p. 6, note 17. ↑ Nelson-Seawright, J. (27 October 2006). "The Prophet Jesse James". ByCommonConsent.com. Retrieved on 2007-10-28. 1 2 (Nauvoo, 11 May 1846). "Opinions of the Smith Family". Voree Herald I (6). Retrieved on 2007-10-28.
a: Letter of Lucy Smith to Reuben Hedlock. b: Letter of William Smith to Reuben Hedlock. ↑ "History and Succession". Strangite.org. Retrieved on 2007-10-28. ↑ Sketch of the Life of Martin Harris BOAP.org. Retrieved on 2007-11-02. ↑ (August 12, 1847). Voree Herald as quoted in Fitzpatrick, pp. 74–75. See also Apostle John E. Page at this same source, on his conversations with Strang on the subject. ↑ Strang 1856, pp. 318–28. 1 2 Fitzpatrick, p. 82. ↑ Weeks, pp. iv, 250. 1 2 A drawing of these plates, with translation and testimony of their discovery, may be found at James J. Strang. (1845). "The Record of Rajah Manchou of Vorito." Strangite.org. Retrieved on 2007-10-28. ↑ http://www.strangite.org/Plates.htm. These studies were based upon a copper image of the plates made during Strang's lifetime. ↑ I Nephi 3:1 – 5:22 (Book of Mormon). ↑ "Book of the Law". MormonBeliefs.com. Retrieved on 2007-10-28. ↑ Strang 1856, pp. 38–46. ↑ These revelations may be read at http://www.strangite.org/Reveal.htm. ↑ Strang 1854b, p. 1. ↑ Smith, Joseph (Sunday, April 7, 1844). "King Follett Sermon" as printed in History of the Church 6: pp. 302–17. Excerpt at utlm.org. Retrieved on 2007-10-28. ↑ Strang 1856, pp. 47–63. ↑ Strang 1856, pp. 157–58, note 9. ↑ Strang 1856, pp. 165–66. ↑ Strang 1856, pp. 155–58. ↑ Strang 1856, p. 150. ↑ Strang 1856, pp. 150–51. ↑ Strang 1856, p. 85. Spelling of "mathematicks" as in original. ↑ Strang 1856, pp. 152–53. ↑ Strang 1856, p. 155. ↑ Strang 1856, pp. 22–23. ↑ Strang 1856, pp. 106–09, 293–95. ↑ "Temple Locations". Strangite.org. Retrieved on 2007-10-28. 1 2 "Women/Marriage". Strangite.org. Retrieved on 2007-10-28. ↑ Strang 1856, pp. 198–200, 227. ↑ "African-Americans". Strangite.org. Retrieved on 2007-10-18. ↑ Strang 1856, pp. 286–87. ↑ Strang 1856, pp. 251–68. ↑ Strang 1856, pp. 168–80. ↑ Statement by Wingfield Watson, quoted in Smith, Heman: (1896) History of the Reorganized Church of Jesus Christ of Latter Day Saints, Independence, Missouri: Herald House. vol. 3, chapter 2, p. 47. http://www.centerplace.org/history/ch/v3ch02.htm. ↑ This sceptre is preserved in the Archives vault of the Community of Christ church in Independence, Missouri. See Cemetourism: Alpheus Cutler, in the paragraph about Alpheus Cutler's sword, which mentions Strang's sceptre as being kept with it in the CofC vault. ↑ Strang 1856, p. 293. ↑ Strang 1854a, pp. 25–26. ↑ (February 10, 1853). Detroit Advertiser. Excerpt in "Mormon Persecution". MormonBeliefs.com. Retrieved on 2007-10-28. ↑ Michigan's Mormon King Photographed by one of his Assassins, article on [www.strangite.org]. This allegation comes from Strangite sources, and is uncooborated in any independent source. ↑ (September 25, 2006). "The Mormon kingdom on Beaver Island". Leelanau Post. Retrieved on 2007-10-28. ↑ "Apostle Post on James' Death". MormonBeliefs.com. Retrieved on 2007-10-28. ↑ (August 14, 1851). Northern Islander as quoted in Fitzpatrick, p. 97. 1 2 (Friday, June 20, 1856). Daily Northern Islander. Excerpt in "Murderous Assault". MormonBeliefs.com. Retrieved on 2007-10-28. ↑ Fitzpatrick, pp. 113, 211. ↑ "Apostle Chidester Announces James’ Death". MormonBeliefs.com. Retrieved on 2007-10-28. ↑ Northern Islander, June 20, 1856. ↑ (2002-10-10). "The Man who shot Strang." BeaverBeacon.com. Retrieved on 2007-10-28. ↑ "Kingdom with a Dominion". MormonBeliefs.com. Retrieved on 2007-10-28. ↑ Strang 1856, pp. 163–66. ↑ "The 1961 Strangite Split". MormonBeliefs.com. ↑ "Mormonism: time of the Gentiles ended". MormonBeliefs.com. Retrieved on 2007-10-28. ↑ "43,941 adherent statistic citations: membership and geography data for 4,300+ religions, churches, tribes, etc." Adherents.com. Retrieved on 2007-10-28. ↑ History of Northern Michigan, pg. 100. Fitzpatrick, Doyle C. (1970). The King Strang Story: A Vindication of James J, Strang, the Beaver Island Mormon King. National Heritage. ISBN 0-685-57226-9. Foster, Lawrence (1981). James J. Strang: The Prophet Who Failed, Church History, Vol. 50, No. 2, pp. 182–192. Jensen, Robin Scott (2005). Gleaning the Harvest: Strangite Missionary Work, 1846–1850 (PDF). BYU Thesis. Retrieved on 2016-02-09. Norton, William (2003). "Competing Identities and Contested Places: Mormons in Nauvoo and Voree". Journal of Cultural Geography. 21 (1): 95–119. doi:10.1080/08873630309478268. Palmer, Grant H. (2002). An Insider's View of Mormon Origins. Signature Books. ISBN 1-56085-157-0. Excerpt at SignatureBooks.com. Retrieved on 2007-10-28. Post, Warren, "History of James Strang: The Birth and Parentage of the Prophet James". Retrieved on 2007-10-28. Silitto, John and Staker, Susan, eds., (2002). Mormon Mavericks: Essays on Dissenters. Signature Books. ISBN 1-56085-154-6. Speek, Vickie Cleverley, (2006). God Has Made Us a Kingdom: James Strang and the Midwest Mormons. Signature Books. ISBN 1-56085-192-9. Excerpt at SignatureBooks.com. Strang, Mark (1961). The Diary of James J. Strang: Deciphered, Transcribed, Introduced, and Annotated. East Lansing: Michigan State University Press. Strang, James J. (1854a, Reprinted 2005). Ancient and modern Michilimackinac, including an account of the controversy between Mackinac and the Mormons. Reprint by the University of Michigan Library. Retrieved on 2007-10-28. Strang, James J. (1848). The Diamond: Being the Law of Prophetic Succession and a Defense of the Calling of James J. Strang as Successor to Joseph Smith. Voree, Wisconsin. Retrieved on 2007-11-03. Strang, James J. (1854b). The Prophetic Controversy: A Letter from James Strang to Mrs. Corey. St. James, Michigan. Retrieved on 2007-10-28. Strang, James J. (1856). Book of the Law of the Lord, Being a Translation From the Egyptian of the Law Given to Moses in Sinai. St. James: Royal Press. Retrieved on 2007-10-28.
van Noord, Roger (1988). King of Beaver Island: The Life and Assassination of James Jesse Strang. University of Illinois Press. ISBN 0-252-01472-3. Wikimedia Commons has media related to James Strang. Church of Jesus Christ of Latter Day Saints (Strangite) Official website of the Strangite Church. Church of Jesus Christ of Latter Day Saints Official website of the other Strangite group. Strangite Mormon Beliefs Another Strangite website containing extensive material on his life, death and teachings. Book of the Law of the Lord Edition of 1856, containing Strang's extensive notes (which do not appear in the original 1851 edition). Revelations of James J. Strang Website containing texts of several revelations issued by James J. Strang. James J. Strang newspapers Excellent site containing reprints of Strangite newspapers, including the Northern Islander. Assassination of a Michigan King Allows purchase of Strang biography of this title by Roger Van Noord. Society for Strang Studies Website of non-sectarian group dedicated to studying Strang's life and work. Michigan History: Moore, Charles. History of Michigan. Chicago: The Lewis Publishing Co., 1915. Vol. 1, pp. 374–376. Briefly mentions Strang as part of a larger collection on important Michigan figures. Clarke Historical Library: Strangite Mormons – Brief biography from Central Michigan University, which has a collection of letters and diaries written by Strang and his followers. A True History of the Rise of the Church of Jesus Christ of Latter-day Saints, of the Restoration of the Holy Priesthood and the Late Discovery of Ancient American Records; MSS SC 756; 20th Century Western and Mormon Manuscripts; L. Tom Perry Special Collections, Harold B. Lee Library, Brigham Young University.